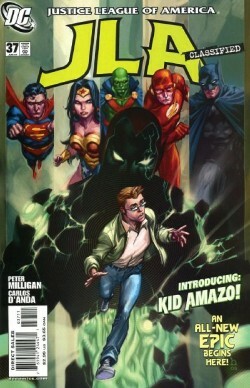 "Kid Amazo" - Part 1: "Into the Abyss!" During a battle between Amazo and the Justice League college student Frank Halloran watched helplessly as his girlfriend Sara was nearly killed by falling debris. Amazo seemingly saves her before escaping. Sara wonders why Amazo would do such a thing, which Superman writes off as happenstance. Later Frank is seemingly kidnapped by Amazo, who reveals that despite all of his memories to the contrary Frank is a cyborg created by Professor Ivo to join his "father" in their quest to destroy the Justice League. To prove his point Amazo throws Frank to the ground. Frank discovers his abilities but rejects Amazo's offer and threatens that if he ever sees Amazo again he'll destroy him. Story - 5: My synopsis really doesn't do this issue justice, no pun intended. There is a lot to this story, both in terms of character and theme that a simple synopsis cannot adequately capture. This is one of those books that really needs to be read to be truly appreciated because the concept is so simple and clear but at the same time it is also really freaking awesome. While this project initially was going to be an original graphic novel with art by a different artist I'm rather glad things worked out the way they did. I've been trying to track down why there was a delay and change in venue, but to no avail. Maybe DC decided that an original graphic novel wouldn't sell enough copies to justify printing it. It wouldn't be the first time this happened. The Giffen/DeMatteis "I Can't Believe It's Not The Justice League" worked out great in this series and there is something neat about waiting for the next issue to see what happens with a story like this. The crux of this story is "free will versus predetermination" and as much as I would love to sit here and say that I came up with the clear and solid phrasing on my own I can't. I mean I "got" that from reading the story. It was there. No subtext in this book. Amazo tells Frank that his destiny is to destroy the Justice League and like many sons who wants nothing to do with the family business he tells Amazo to go take a walk. Well, he told him he would destroy him, but you get the idea. The free will versus predetermination comes from an interview with Milligan, but it sounded so good that I figured I'd use it here. This concept makes the story interesting and adds a thought provoking element to the reading experience. But it is the character bits that sold me on the story. I really like Frank. He may be pretentious and wrapped up in his own head, but frankly I have my pretentious moments and I spend way too much time wrapped up in my thoughts, so I can totally relate to him. Milligan added the girlfriend complete with parental issues and the character was suddenly alive for me. I also liked the scenes with Amazo and since my only other experiences with Amazo were as a rampaging killing machine (well, outside of the awesome job JUSTICE LEAGUE UNLIMIATED did with the character) so the rather calm and collected Amazo was something of a departure. A welcome one, but a departure nonetheless. The only problem, and I really hesitate to call it a problem, is how Superman totally wrote off Sara's concerns that the Justice League's negligence by not taking the battle away from a populated area that was the cause of her almost getting crushed by falling debris, not Amazo. But I know in my heart that this was a purely fannish reaction on my part. Milligan did such a great job with the rest of the issue that I'm not going to let that part of my personality that has the voice of a petulant five year old who screams, "Hey, you can't talk to Superman like that," ruin a perfectly good comic book. Art - 5: I really liked the art in this book. Carlos D'Anda has a style that reminds me of Todd Nauck, and since I really like Nauck's style this is a good thing. The level of detail with the tech is impressive and I really liked his interpretations of the Justice Leaguers. What impressed me was the emotion Carlos infused into the characters. There was a lot of subtlety in the work that elevated the characters from line drawings to people I can relate to and feel for. Comic books work best when the art and the writing mesh together that you really see the whole of the piece and not just the different bits. D'Anda and Milligan came together and produced a really solid comic book story. And having seen the original art from the graphic novel I can honestly say that as interesting as that art was Carlos' is so much better. Cover Art - 5: Howard Porter has gone through an interesting evolution as an artist. Back in the nineties he had such a slick and clean style and I can't even begin to tell you how much I loved his work on JLA. The new stuff he is putting out is different, but at the same time it is still really freaking good. This cover is a great example of his new style at its best. I have no problem giving this cover a five out of five.